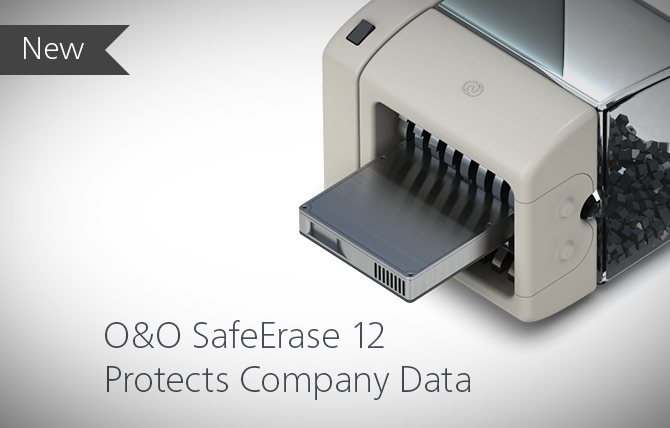 O&O SafeErase supports Windows Server 2016, Windows 10, Edge, Chrome and Firefox. This product affords you the maximum protection for your confidential company data without the astronomical costs it normally involves. Your company’s servers are the places where all internal information such as customer data and the figures for the sales and bookkeeping departments are gathered. That also goes for the backups containing vital information collected over years. If you ever decide to replace a single disk or an entire server with a new one, the information contained on your old material can quickly turn into a major security risk. Please make sure that all data on your disused servers and computers are permanently removed before their disposal or return to a leasing company! Do not take risks with your company data! O&O SafeErase permanently deletes your confidential files using recognized methods so that a recovery is never possible, not even when using the best file recovery software. It also deletes all internet history so that nobody will be able to detect your Internet traces and your online accounts are protected from data thieves or hackers. All files, settings, applications and the operating system are deleted so that a recovery even with the best file recovery software is impossible. You can delete an entire computer including the system partition without boot media. After restarting the system the deletion process begins automatically. Should an SSD not support TRIM, then the data is overwritten with zeros to avoid wear effects. In addition to the clear user interface, you can also use the Command Line version of O&O SafeErase. You can use it via the Windows command prompt. It is suitable for the integration into scripts to be executed automatically. Protect yourself by letting O&O SafeErase permanently delete your worn out disks using scientifically recognized methods. There are a total of six deletion methods available to you, each one offering its own special type of deletion and level of security. The Admin Edition is person-bound, i.e. it is licensed per administrator and can be applied to all computers in the company. The Tech Edition allows the user to provide a data deletion service to clients. It is licensed per technician, i.e. it allows a technician to work on any number of different computers.